During the night of 1 July, I found out that the was on Okinawa was not quite over. Around midnight a party of Japs blundered into a fight with the guards about 50 yards from my tent. I put my pistol on a chair beside the bed. The shooting died down a little later and I went to sleep. The next morning, as I was taking off for Manila, Col. ‘ Photo’ Hutchison told me that he had had another battle going on during the night near his HQ. On July 10th it was announced from Washington that the B-29s in the Marianas would form the 20th Air Force, under Gen. Twining and that those operating from Okinawa would form the 8th Air Force, under Jimmy Doolittle. The 8th & 20th would together be called the United States Strategic Air Force, with Gen. Spaatz in command. On the same day, Nimitz turned over control of the 7th A.F. to the Far East Air Forces and told the Marine Fighter Wing at Okinawa to operate in conjunction with our (Army) show there. On the 12th, Lord Louis Mountbatten and a few members of his staff flew from India to Manila for a conference with MacArthur. We briefed him on the coming Olympic Operation and his staff in turn gave us the details of the proposed British operation to recapture Singapore. Mountbatten wanted some bombing assistance at that time, if we had any to spare. MacArthur asked me what I could do. I gave him the details about the Australians and our B-24s and Mountbatten was quite pleased. All through July we kept moving aircraft into Okinawa from both the 5th and 7th Air Forces. Generals Whitehead and Tommy White set up their HQ on the island and began the final sweep of Japanese shipping from the Yellow Sea and the Straits of Tusishima, between Japan and Korea. 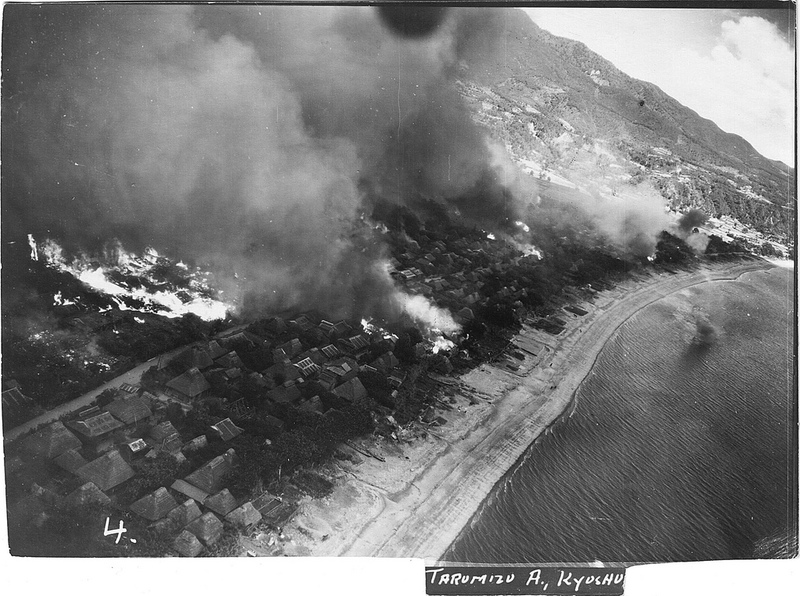 In conjunction with the B-29 from the Marianas, who were battering the big cities of Japan apart and burning them down, we concentrated our attacks on the island of Kyushu, smashing airdromes, burning up gasoline stocks and wrecking the railway centers, bridges and marshalling yards. The attacks were being made with a ever-increasing weight, as airdromes were being finished on Okinawa, allowing us to move the aircraft forward from the Philippines and the Marianas. By the end of July, on an average day, when weather permitted large operations, there would be over 1500 of my airplanes operating along the line from Japan to Formosa to Shanghai to Borneo and the Netherlands East Indies. Of this number around 600 bombers, strafers and fighters would be attacking targets in Japan itself. It was a far cry from the days back in 1942, when a raid of 50 or 60 planes was such big news that we boasted about it for days! William Mercantonio – East Orange, NJ; US Army Air Corps, WWII, Korea, TSgt. 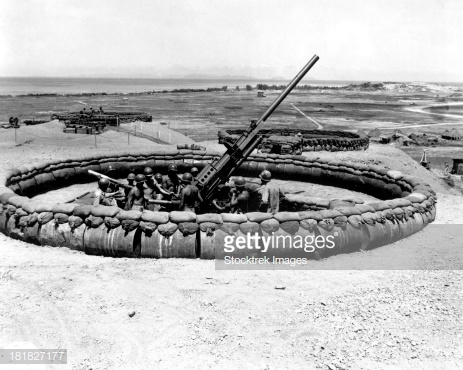 Posted on November 15, 2018, in Uncategorized, WWII and tagged 1940's, History, Kenney, Military, Military History, Okinawa, Pacific War, Philippines, veterans, WW2, WWII. Bookmark the permalink. 83 Comments. It brings the soldier back down to being human and having empathy for others. Thanks for all The information you gave. Very usefull. I love those first few lines. The fighting was 50 yards away so he put his pistol on the table. He must have been through quite a bit to be that relaxed about it. When you are usually in the middle of it, 50 yards must seem quite a distance, eh? Thank you. I appreciate your visit! That “drink from the hose” cartoon is so funny. I used to drink from the hose all the time when I was a kid. Between that and going barefoot in the dirt — not to mention eating fruit straight from the trees and veggies straight from the garden — it probably helps to explain why my immunity levels are solid. Down here in hot ol’ Texas, you do need to let hoses run for a bit before drinking, though, just to let the algae get washed out. I keep thinking about 1,500 planes and 600 bombers. I can’t imagine. Of course, that probably was part of the point: attacking in such numbers that the Japanese couldn’t imagine what was happening — or what might be coming next. There was a kid in my grade school who would eat a spoonful of dirt for a nickel. The entrepreneurial spirit lives! 1500 aeroplanes in the air at once attacking the Japanese. I bet they were beginning to regret Pearl Harbor. So much destruction, it’s shocking. Its good to remember that such extreme measures were once necessary and to avoid falling into to conflict again. 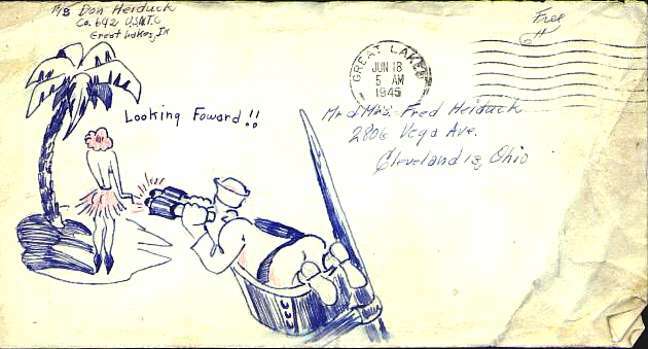 Love that “looking forward” envelope from Great Lakes ! Oh man, that sweet , sweet feeling of being a short timer. Very interesting. Never knew this level of detail. Keep up the good work. Terrific, Phil! Get that scrapbook back – you’ll be amazed at what you discover and learn about your father and his fellow soldiers!! Excellent, GP. I enjoyed the General’s perspective. I like reading the personal POV, so their feelings get put into their reports. Thank you for taking time from your 3 “children” to read it. Things were getting organized for the Japanese invasion, so this post wasn’t as interesting as some have been, I realize. Those mass-bomber raids must have been a sight to see, and terrible to be the target of. I can even fathom it, Pete. Thank you for visiting today, have a good evening! 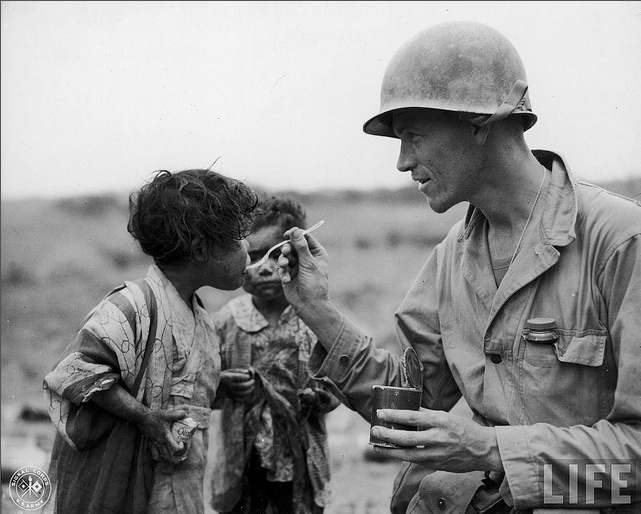 It’s not unusual to see an American soldier taking care of the enemy’s children (as in the picture you included). I was thinking I never see that happening in the reverse but then, my brain finally got to the point that we don’t have battles around our children. Good post, GP. I love reading about Okinawa. Yes, our children haven’t had to go through that – Thank heavens!! I know why you love reading about Okinawa!! Will either of your children be home for the holidays? Given that the reference was to mean perhaps 200 of those were B-29’s, with their extensive bomb loads – Wow! Pretty hard to imagine, isn’t it?!! I love the insights, the cooperative nature of the war and how it changed post war too. In Australia drinking from the hose was quite normal. I remember as a kid it was quite normal. It’s only that I live in FL now and never leave my ice water very far away from me that I don’t think about it. I’m trying to imagine 600 planes in the air above me. Fortunately, I am coming up empty. I love that second cartoon. You and me both, Dan! And that cartoon sure has made a hit today. I hope a few people have wondered over to see David’s site. I like the joke with the water hose. It is all a matter of perspective in life. Isn’t that the truth! We all see things differently. The July bombing on Japan soil was just a prelude on what to come. I wonder what Japan was thinking at that time. Love the guy drinking from the hose. My husband did that once on a hot day and I was horrified. I won’t even allow our dog drinking from the puddle. We are too clean that our immune system suffers. I don’t remember so I guess not. But I played in the dirt but had to clean up before Mom would allow me in the house. I have no problem drinking from a hose. I remember doing it years ago. Here in FL, it’s always so hot, my ice water isn’t very far away! It is good to be clean, but I’ll bet the ones that let it slide once in a while have better immune systems than those who are sterile. I agree. I live in a sterile world and if I eat anything remotely unclean, I get very ill. No immunity against germs haha! Sorry – I forgot about SARS, but I always remember MONK ! I first saw him on an old series called, WINGS, he played a taxi driver – he was funny then too!! WINGS…Now I must google it and see if Youtube has it. Great you know about MONK. I enjoyed the character that Tony played MONK. Yup, that’s who I’m talking about. Cute show! Have you seen the documentary about Robert McNamara? I found it profound. The Fog of War trailer brings back a lot of memories. Looking back to that era with McNamara’s eyes should prove interesting indeed. An essential view for you, GP. That was quite an era. It baffles me when people refer to it as Camelot. “Camelot” referred to the JFK era. When JFK was killed, there were only a couple of hundred “advisors” in The Nam. LBJ put in the first combat troops and then the bombing started and absolutely no one referred to LBJ as Camelot. Anyway, by the time that LBJ, during Tet, threw up his hands and quit, about 30,000 Americans had been killed. Nix ran on an “honorable way out of the war”. He and Kissinger ignored a North Viet attempt to start peace talks, and the war, and the bombing escalated. By the time we were run out, 68,000 Americans and 2,000,000 Viets had died. No one called that “Camelot.” Just a bit of history, that you like here…. JFK shouldn’t have put us in there in the first place, we had been warned by the best generals we had since before WWII and putting the “advisers” in quotes is accurate, and how many “support” troops were sent to “protect” them…… I know the specifics! Well, we probably all know the specifics, including how Nix ignored the Cong offer to start peace talks. But “our” real war started way before JFK, back to Ike who financed the French in IndoChina for years. Although Ike refused to use the A-Bomb! But “Camelot” means something specific, and Nam wasnt being carpet bombed under JFK. In fact, as you, and we, well know, some people think JFK was ready to withdraw from Nam when he was killed. In fact, thats why “they” (whom ever “they” is) killed him. Personally, I dont believe for a minute that JFK was about to be “the first president to ‘lose” a country to the commies.” But if you want to blame a Liberal, blame LBJ, and then good old boy Nix for keeping it going. Robert Mac was not part of Camelot. PS: thats exactly why I put “advisors” in quotes. Interesting, what? So, 2,068,000 people died. But at least Nix couldnt be blamed since he had fled the office by then…. Another JFK conspiracy theory? OMG! Good lord. SATIRE! Thats why “they” are in “quotes”. Its tough to talk anything through here because you seem to want to be the only one talking about history. WTF! Hey – it’s my site. I’m trying to talk WWII history. I encourage my readers to tell me what they know about the war too. You just want to dominate a statistical debate. Sure, its your site but I may be the only one who actually reads it. You gave a thumbs up when that Fog of War vid was posted about Vietnam, and then you gave another thumbs up to Cindy when she said it was essential. You responded with “Camelot” which has nothing to do with WWII. So, Im just following your editorial lead and commenting. Im just discussing, you insist its an argument. The fact that Im the only one doing that here aint my problem. Maybe others might like to join in? They’re welcome to if they wish. It makes you put it all in perspective, eh Derrick?! The man it came from, David, certainly knows what the cartoon is saying. You help is much appreciated, Ian.